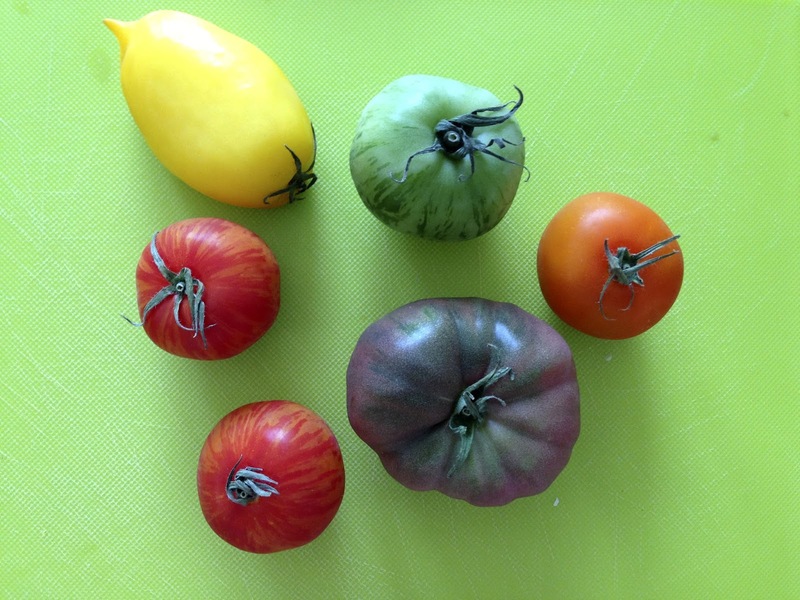 Have you noticed that Heirloom Tomatoes are starting to 'crop up' everywhere these days? Well, not everywhere as in at the gas station or library, but almost every produce store and supermarket seems to carry these beautiful fruits at a reasonable price, whereas in the past they seemed like something you would have to seek out at Whole Foods. They come in all colours of the stoplight rainbow - bright yellow, striped red, lime green - and look absolutely mouth-wateringly beautiful in a salad. The coolest thing about them is that all of the various types are so different from one another in terms of acidity, texture, sweetness, crunchiness, and of course, attractiveness, which makes a salad like this one so interesting. So after buying a package of Heirloom tomatoes and wondering what I should do with them, I found the recipe for this salad in an issue of Food Network Magazine (a great magazine!) and decided that it was a must-try as a side dish to hamburgers at a family BBQ at our house this summer. 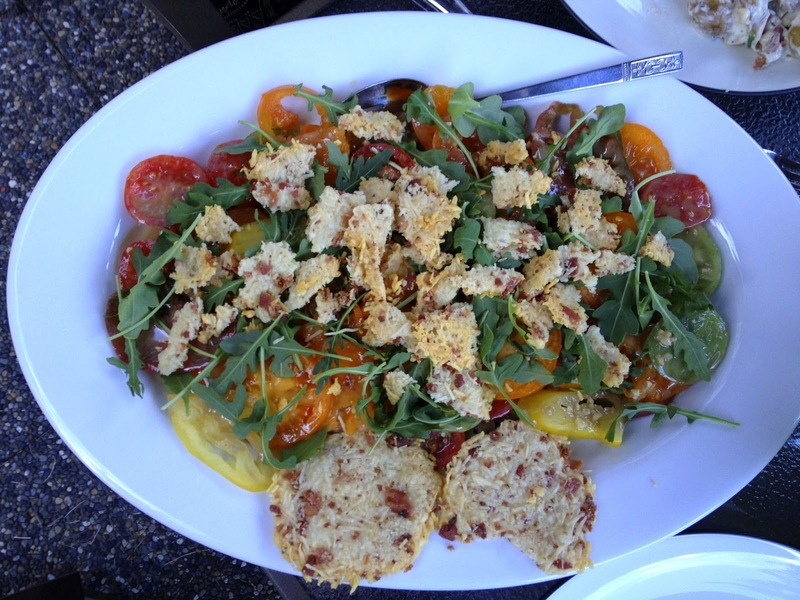 I am a big Caesar Salad fanatic, and the Heirloom tomatoes in combination with the Caesar dressing was too much for me to resist. Not only that, but it gets topped with homemade (and very simple to make) bacon-parmesan crisps. Om nom nom nom, drool. Even with the bacon-parmesan crisps, this salad still clocks in at less than 200 calories per serving. 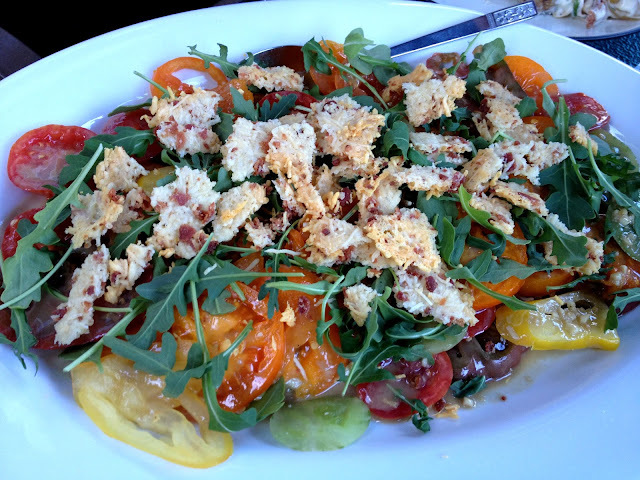 If you can't find heirloom tomatoes where you live, don't fret...this salad would be great with any type of medium-sized tomato and will taste just as good. Cook the bacon in a pan over medium heat, turning occassionally, until very crisp (or use the microwave). Transfer the bacon pieces to a paper-towel lined plate to soak up any excess liquid fat. Once cool, finely chop the bacon. Preheat the oven to 375F. 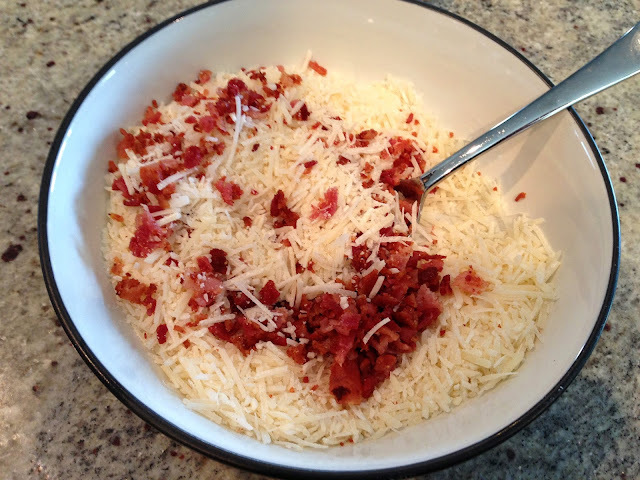 In a small bowl, mix the chopped bacon with 1/2 cup of the parmesan cheese, and the flour. Line a baking sheet with parchment paper. Divide the bacon-parmesan mixture into four piles on the baking sheet, and flatten the piles with a fork until about 3 or 4 inches in diameter. 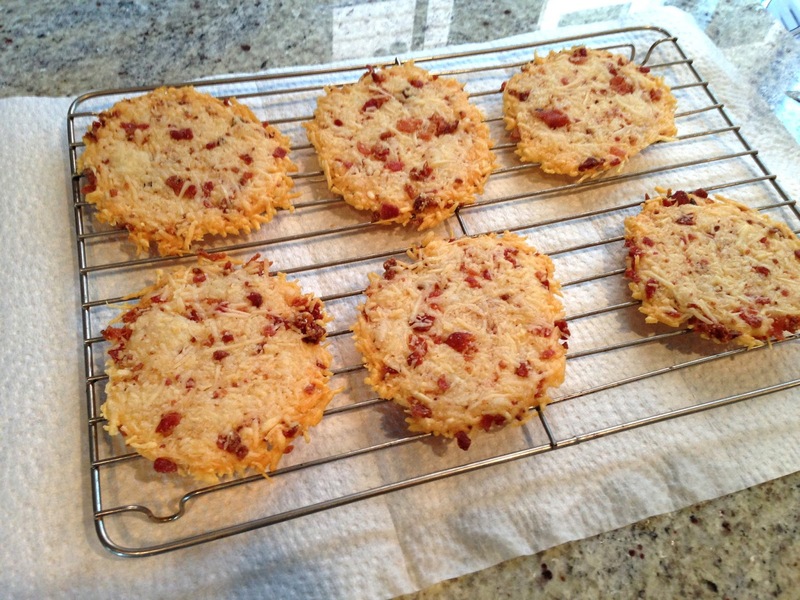 I made 6 bacon-parmesan crisps because I was 1.5-ing the recipe. Pop into the oven and bake for about 7 minutes, or until the cheese has melted and the crisps are golden brown. Remove from the oven and allow to cool on the baking sheet for about 5 minutes, then carefully transfer to a cooling rack to cool completely. To make the dressing, place the anchovy paste, minced garlic, lemon juice, olive oil, Worcestershire sauce, and the remaining 1/4 cup of parmesan cheese into a container with a lid, and shake vigorously to combine. If you have some time between completing this step and serving the salad, place the dressing into the fridge to allow the flavours to mingle and get to know each other. When you are ready to serve the salad, arrange the sliced tomatoes onto a platter, sprinkling the sea salt, cracked pepper, and some of the dressing onto each layer as you go. Take a couple of handfuls of baby arugula or watercress and distribute over the top of the salad. 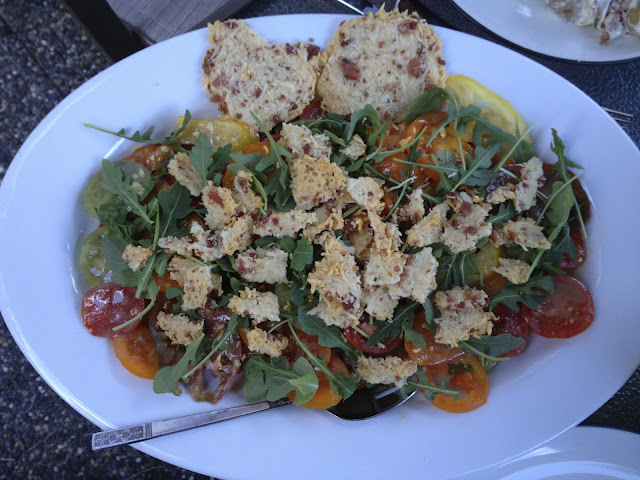 Finally, (your pièce de résistance), break the parmesan-bacon crisps into small pieces and sprinkle on top of the salad.